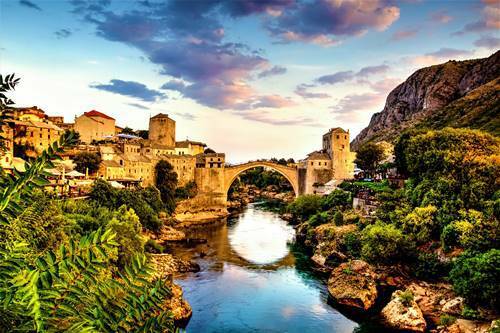 Situated directly on southeast Europe’s Balkan Peninsula, Bosnia and Herzegovina is home to an abundance of quaint medieval villages, beautiful scenic rivers and lakes, and the dramatically craggy Dinaric Alps. The capital city of Sarajevo boasts a well-preserved Old Quarter and many stunning examples of fine landmark architecture. Visit the 15th century Baščaršija to soak up the atmosphere of the old bazaar, and to admire the historic and cultural hub of the city. As a contrast, there are also more modern attractions including those that are associated with the 1990s civil war. The Galerija 11/07/95 features a permanent display of photography, video and audio testimonies that create a powerful memorial to the infamous Srebrenica massacre. Bosnia and Herzegovina proudly showcases the stunning cities of Sarajevo and Mostar, which feature distinctive Turkish-era architecture, traditional style restaurants, quirky bars and a vibrant arts scene. The country’s rural hinterland boasts magnificent medieval castles, majestic cascading waterfalls, beautiful mountains, and rivers that offer an ample selection of water-based recreational activities. Visit the iconic Stari Most in Mostar’s Old Town, and take a leisurely stroll along its historic swooping arch structure. For a unique experience, visit the quaint town of Medjugorje, which is famous for the sighting of a Virgin Mary apparition. Take advantage of the country’s stunning mountainous landscapes and winding rivers. Admire the impressive Kravica Waterfall that plummets 25m into a gorgeous emerald coloured pool. The idyllic beauty spot is the perfect location to enjoy timeout from the vibrant cities. If you’re feeling active, you can join a river rafting expedition. History and culture lovers can learn all about Bosnia and Herzegovina’s rich heritage at the Ostrožac Fortress. The photogenic castle flaunts genuine Gothic architecture, and ramparts and towers that you can explore. There is also a manor house situated in the grounds. The historic city of Mostar was heavily bombed during the civil war and the subsequent breakup of Yugoslavia. The old Ottoman-style bridge of Stari Most was completely destroyed in 1993. Through combined efforts with the international community, it was rebuilt and restored to its former glory in 2004. The city’s landmark attraction is made of pale stone that reflects sunset and streetlight illumination. It spans the Neretva River and is lined with a good selection of chic cafes and restaurants. 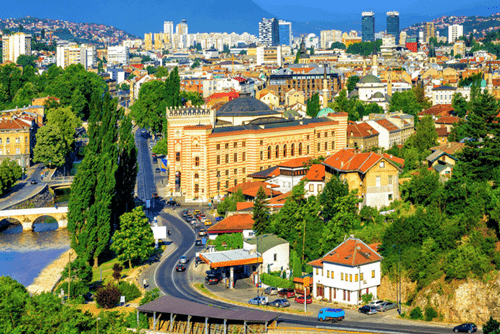 Located on the banks of the Miljacka River, the city of Sarajevo is embraced by the dramatic Dinaric Alps. On a day trip to the historic centre, visit the landmark attractions of the Baščaršija bazaar and admire the Ottoman-era Gazi Husrev-bey Mosque. Meander through charming stone paved streets of the Stari Grad, and explore the colourful shops and stalls that sell just about everything. To enjoy the best views of the city, take the lift to the 36th floor of the Avaz Twist Tower observatory. 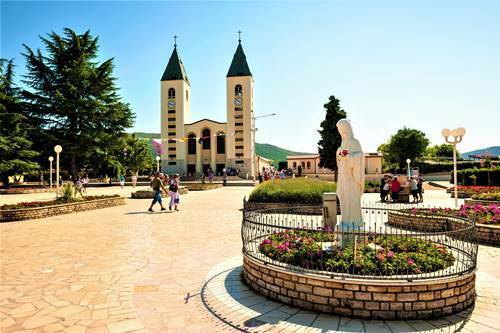 The charming town of Medjugorje is a hugely popular destination with visitors wishing to have a religious experience. In the town in 1981, six local children were reportedly blessed with an apparition of the Virgin Mary. The sighting occurred on the rocky hillside of Crnica, which is situated close to the country’s border with Croatia. The site is now locally known as Apparition Hill. Take a tour of the little town and admire the ‘Queen of Peace’ statue that is located at St James Church.